About 2100 on 30 January 1968, Lieutenant Colonel Glenn K. Otis, commander of the 3d Squadron, 4th Cavalry, was ordered to send one troop to aid Tan Son Nhut Air Base on the north side of Saigon. Colonel Otis directed the Troop C commander, Captain Leo B. Virant, to prepare for this mission and to put his troops on short notice alert. Troop C was at Cu Chi, twenty-five kilometers northwest of Saigon, with one of its platoons securing the Hoc Mon bridge ten kilometers closer to Saigon on National Highway 1. At 0415 hours on 31 January 1968 Colonel Otis was ordered to commit Troop C to block a Viet Cong regiment that had attacked Tan Son Nhut Air Base. The troop was on its way in fifteen minutes and while it was en route was ordered to destroy enemy forces attacking the air base itself. Troop C was to be under the operational control of the Tan Son Nhut commander; a guide from that headquarters was to meet the unit at the south side of the Hoc Mon bridge and lead it to the air base. To avoid ambushes along Highway QL-1, Colonel Otis flew over the unit and, dropping flares to discourage the enemy, guided it cross-country to the Hoc Mon bridge. Troop C then passed through its own 1st Platoon, which remained at the bridge, met the guide from Tan Son Nhut, and moved toward the air base. Colonel Otis returned to Cu Chi to refuel and rearm. The only information provided to Troop C was that a large enemy force had attacked from west to east across Highway 1 and penetrated the airfield defenses. As the troop approached the air base about 0600, it came under heavy small arms, automatic weapons, and rocket grenade fire. 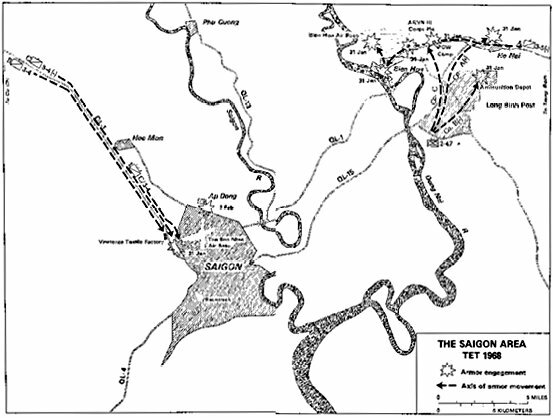 The cavalrymen attacked to split the enemy force where Highway 1 passed the southwestern gate of Tan Son Nhut. This move isolated approximately 100 Viet Cong inside the air base and kept the main body outside the gate. The full brunt of the enemy attack now fell on Troop C. In the first few minutes several tracked vehicles were hit and troop casualties were heavy. Captain Virant was seriously wounded in the head. The remaining elements of Troop C kept firing and succeeded in slowing the assault, but enemy fire forced some members of the troop out of their damaged vehicles into a ditch alongside Highway 1. Unable to communicate with the air base, the troop called the squadron at Cu Chi for help. Colonel Otis was present when the call came in and immediately started back to Tan Son Nhut, calling 25th Infantry Division headquarters for release of Troop B from its mission of guarding the Trang Bang bridge, fifteen kilometers northwest of Cu Chi. Instead, the 1st Platoon, Troop C, was released from the Hoc Mon bridge, and Colonel Otis directed it to move to Tan Son Nhut immediately. In addition, he ordered the squadron’s air cavalry troop to support Troop C. Flying over the area, Colonel Otis observed Troop C deployed in an extended column formation along Highway 1, with four tanks and five personnel carriers burning. Even from the air, he could see that the unit was hard pressed. Ammunition was running low in Troop C when the air cavalry helicopters arrived. Gunships immediately attacked the enemy positions, firing rockets and machine guns. As the last few hand grenades were being thrown by the ground troops, two helicopters from Troop D, under heavy automatic weapons fire, landed with ammunition and took off the wounded. At 0715 the 1st Platoon of Troop C arrived. Colonel Otis directed it onto the airfield and then south to the left flank of Troop C, where it attacked west, relieving some of the pressure. Colonel Otis ordered Troop B, commanded by Captain Malcolm Otis, to leave the Trang Bang bridge and move at top speed down Highway 1 to Tan Son Nhut, forty-seven kilometers distant. Captain Otis’s troop, traveling fast, reached the battle area in forty-five minutes. When the troop arrived, it executed a column right toward the west at the Vinatexco Textile Factory, which put it parallel to the northern flank of the Viet Cong attack. With all vehicles of Troop B off the main road and strung out in column, Colonel Otis directed a left flank movement that brought them on line on the flank of what was later estimated to be at least 600 enemy soldiers. Troop B attacked with such intensity that many of the enemy immediately fled to escape the fire. Some attempted to reach a tree line three kilometers to the west across open rice paddies, but Captain Otis sent his 3d Platoon and Troop D gunships to cut them off. Caught in a cross fire between Troops B and C and heavy air and artillery fire, the Viet Cong were pinned in place. The battle reached a climax at about 1000, when Troop B’s flank attack began to take its toll of the enemy. Although fighting went on until 2200, from 1300 to 2200 the primary business was mopping up-hunting down the confused and beaten enemy. Subsequent sweeps of the battle area produced over 300 enemy dead, 24 prisoners, hundreds of enemy weapons of all kinds, and enough equipment and ammunition to fill a five-ton truck. At 1400 on 31 January, Colonel Otis was finally able to rendezvous with the Tan Son Nhut command. From the time Troop C called, asking for help, until 1400, the action was completely independent of the Tan Son Nhut command, controlled only by the cavalry squadron commander. The movement of Troop C, 3d Squadron, 4th Cavalry, to Tan Son Nhut Air Base was a difficult night maneuver that achieved tactical surprise. When the enemy proved to be more formidable than had been expected, timely reinforcement, gunship and artillery support, and aerial re-supply by units under command of the squadron turned the tide. The fact that the battle was fought by one unit and directed by one commander greatly facilitated control, but the deciding factor was the cavalry firepower that dominated the action. Colonel Otis’s cavalrymen were to have no rest after Tan Son Nhut, for the 3d Squadron, 4th Cavalry, was soon involved in its second major battle in as many days. This time it had help from Troop A, 1st Squadron, 4th Cavalry, which, after constant fighting throughout Saigon, was sent to Tan Son Nhut under operational control of the 3d Squadron, 4th Cavalry. Shortly after daybreak on 2 February, the 2d Battalion, 27th Infantry, the 3d Squadron, 4th Cavalry, and Troop A, 1st Squadron, 4th Cavalry, were ordered to conduct a reconnaissance in force through Ap Dong, a village north of Tan Son Nhut. Following tactical air strikes and an artillery preparation, the operation commenced shortly before noon when Troop A moved with the infantry to search the village. After a bitter all-day battle, the mounted units and the infantry succeeded in clearing the village and securing the northern perimeter of the air base. Note: The above account was taken from “Mounted Combat in Vietnam” Chapter 5, pages 118-123 by General Donn A. Starry. Published by the Department of the Army 1989.